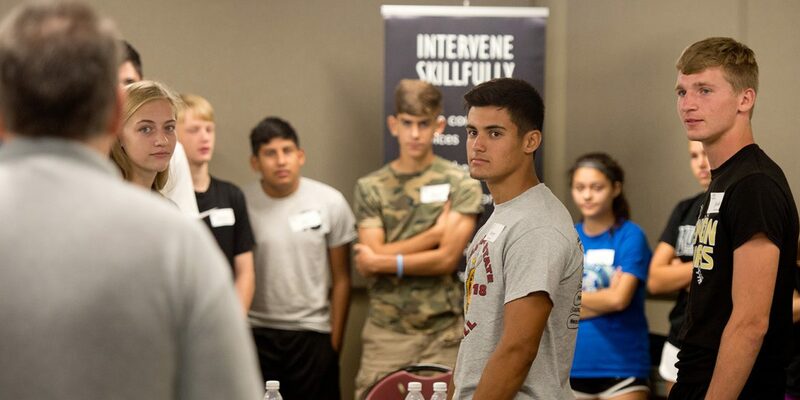 On August 1 and 2, 50 Newton (Kan.) High School (NHS) student-athletes and coaches took a break from their summer break to learn how to be good leaders among their peers by participating in the Hesston College Leadership Academy. Drawing on leadership competencies outlined by the Kansas Leadership Center (Wichita) as well as the expertise of the Hesston College faculty and staff who lead the training programs, the training was customized to address challenges and areas for change identified at NHS. “Our purpose in providing this training to these students was to create advanced leadership skills in some of our athletes so they can have a lasting impact on their teams, their peers and Newton High,” said Mark George, social studies teacher and head baseball coach at NHS. In the two half-day sessions, the students learned to become more in tune with their strengths and vulnerabilities as well as their personality and conflict styles, thereby becoming more effective leaders. George says the six NHS coaches who attended the leadership training along with the 44 students plan to continue meeting with the group throughout the school year to encourage one another in their leadership roles, show support as they work through challenging situations and give another level of accountability. “I’m excited we were able to work with the high school demographic and find ways to help them work intentionally toward a positive culture across the Newton High student body,” said Rachel Swartzendruber Miller, Hesston College Leadership Training Program co-creator and vice president of Admissions and Financial Aid. Hesston College started the customizable leadership training program in summer 2017 for schools and companies looking to addresses their specific adaptive challenges. Excel Industries (Hesston) was the first company to send employees for leadership training, with a cohort of 26 going through the program in July 2017 followed by another Excel cohort of 39 in December 2017. Schools or companies interested in offering the training to their students or employees can contact Swartzendruber Miller at rachelsm@hesston.edu or 620-327-8206.